The girls made it through the night in their new house. I was so excited to let down the trap door and watch them walk down that I was in my robe in the back yard at 5:30 this morning! I lowered the door and…nothing. I looked in the nest box door and saw them all lined up on their perch sitting quietly. I waited and watched and then gave up and went to make Jim’s lunch and fix the coffee pot. Jim said he thought they wouldn’t walk out until sunrise. I made that noise I always make when he’s being a smarty pants–sounds like letting the air out of a birthday balloon. Anyway, he looked up sunrise/sunset times for Montgomery, on the “intra-web”. We waited some more. Then, they finally walked out about 10 minutes AFTER sunrise, Mr. Wizard! I assume the girls were putting on their faces and didn’t want to come down until they looked pretty. This sunrise/sunset thing also explains why they wouldn’t go up the stairs of their coop last night. We were sitting in the back yard for a long time waiting for that magical moment when they would discover the stairs and go up to see their great bedroom. 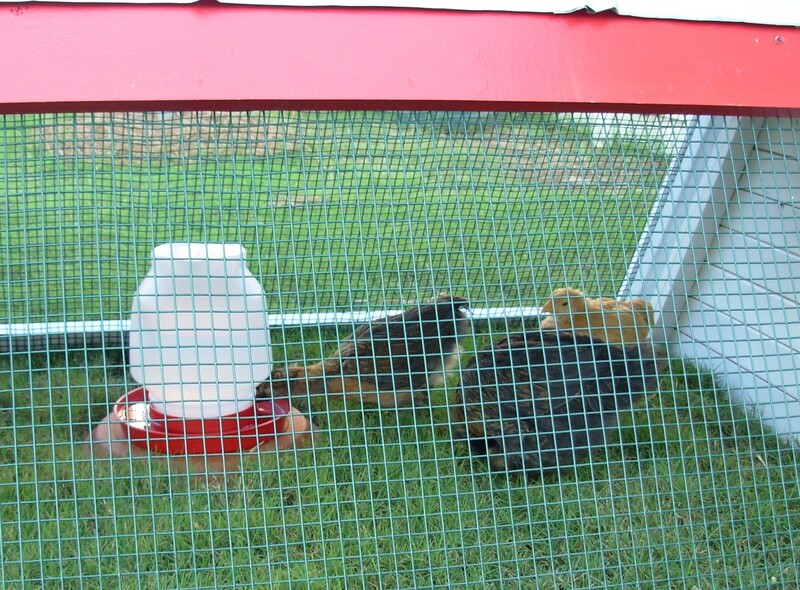 They just kept pecking, and cooing and chasing each other and I was getting impatient. So I grabbed Daisy and shoved her through the upstairs door. Then I grabbed Violet and did the same. I could not catch Miss Rosie so we sat and watched to see what she would do. She can’t be apart from Violet for more than 60 seconds so as soon as she heard Violet’s squawk she found the stairs and walked right up! Yay!!! Then I pulled up their little red gangplank and locked them in for the night. According to the sunset chart they would have put themselves to bed about 15 minutes later if I had just been more patient. So tonight we’re gonna wait for the magical moment when the stars align and the chickens become ONE with the universe and they waddle magically to their sleeping quarters on their own. Our crazy cat Sammy enjoyed the coop too after she got tired of trying to break in and get some chicken nuggets. 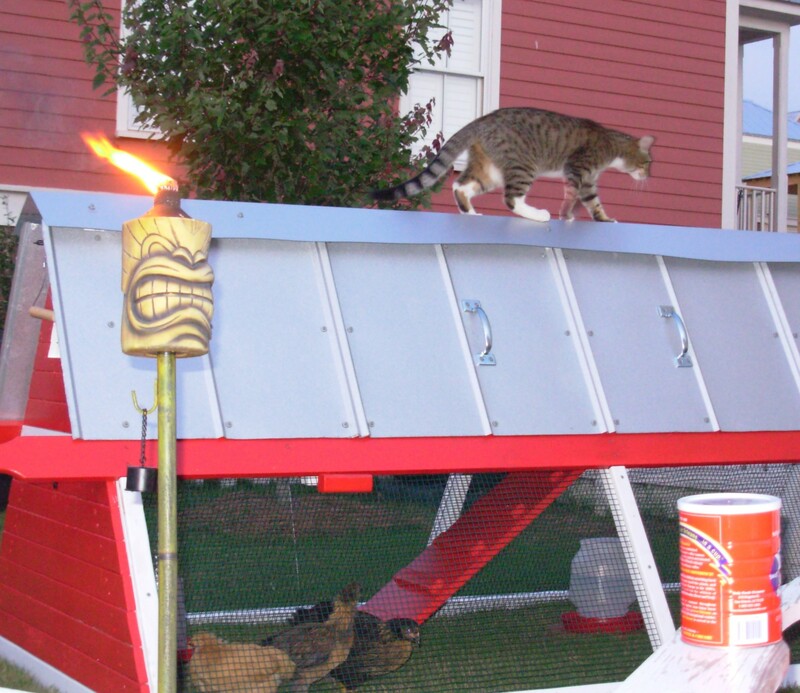 How many chickens have there own Tiki torch? Why thank you. I aim to please.